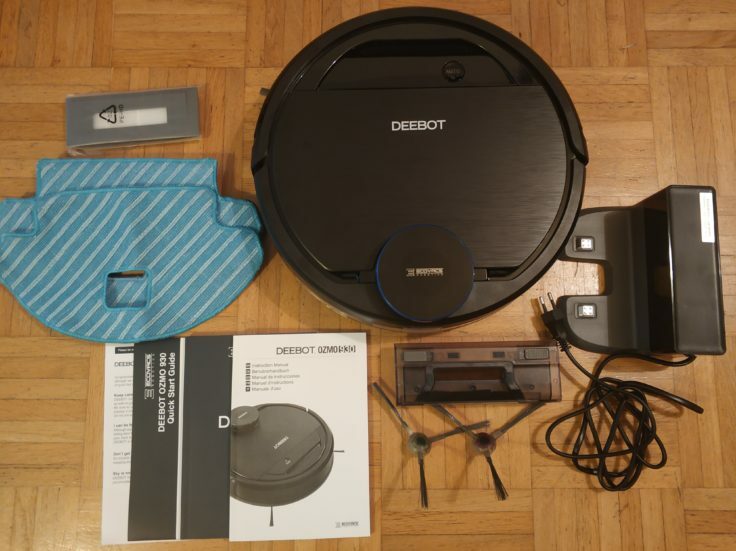 ECOVACS DEEBOT OZMO 930 vacuum robot review: The new top model? 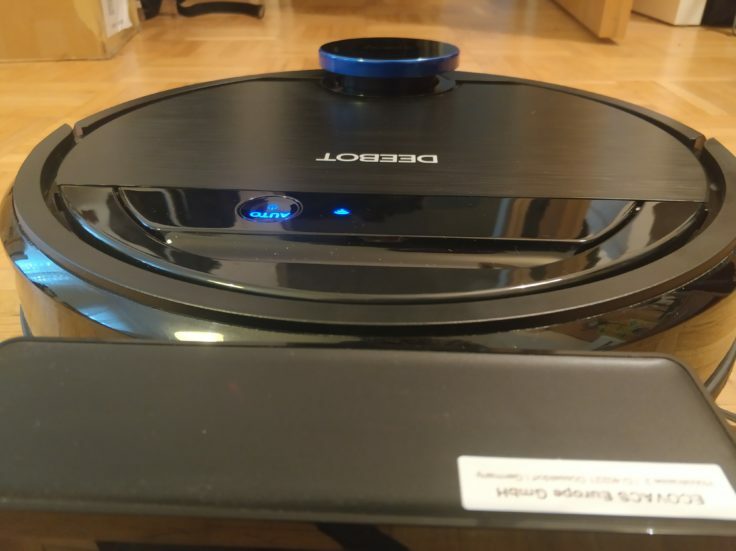 Review ECOVACS DEEBOT OZMO 930 vacuum robot review: The new top model? 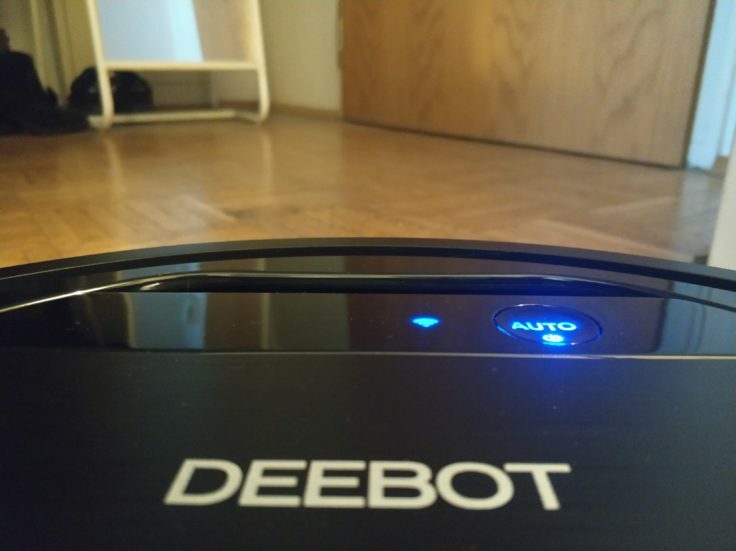 Vacuuming and wiping at the same time, app control, laser distance sensor including mapping and room division, underground detection … packed with technology and functions, the DEEBOT OZMO 930 is the flagship of the Chinese manufacturer ECOVACS ROBOTICS. 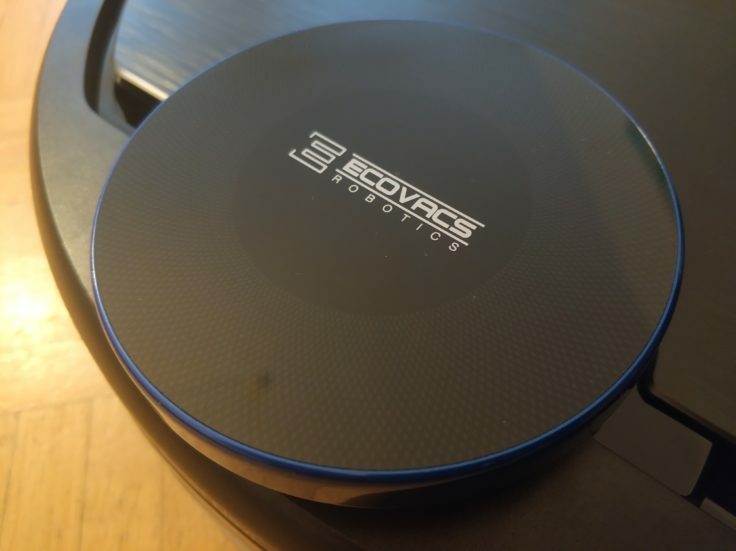 As a manufacturer of household robots, ECOVACS has been the market leader in the Asia-Pacific region since 2010 and is already the second largest market share in Europe. We tested the OZMO 930 and compared it with the top models. I usually leave out the evaluation of the packaging because I personally find it rather uninteresting. In most cases, these are large, square boxes without differentiating them from other packaging. This time I would like to make an exception, because the packaging is really good to look at – very chic and tidy. This is packaging that looks good. 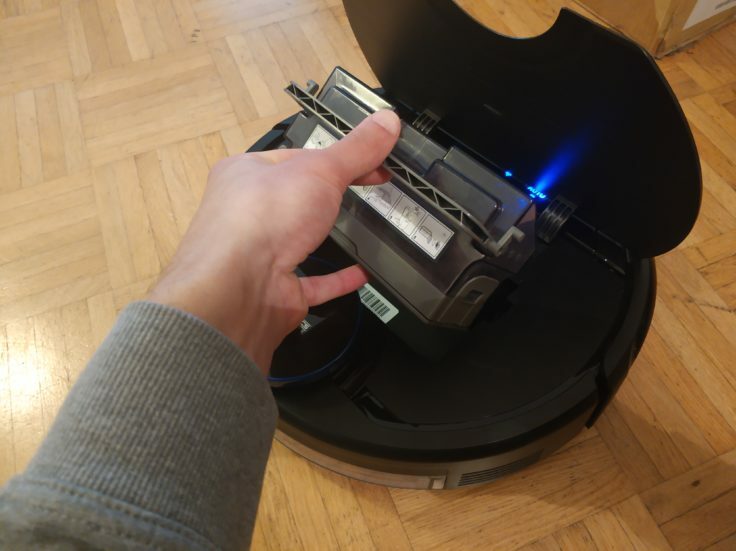 With the 35.4 x 35.4 x 10.2 cm vacuum robot, you should check in advance whether it fits under the sofa or bed (if you want it to vacuum there). After all, the height of 10.2 cm cannot be disregarded due to the laser distance sensor mounted on the upper side. Otherwise, the sofa has to be raised a little ( vacuum robot-friendly households are on the way). Fortunately, the weight of 3.9 kg plays a minor role. From experience, the robot eventually will be lifted – and the weight of the DEEBOT will astonish you. The laser distance sensor is not only very practical, it also looks good. The design of the “China version” of the OZMO 930, the DE33, has already been roughly familiar to us. 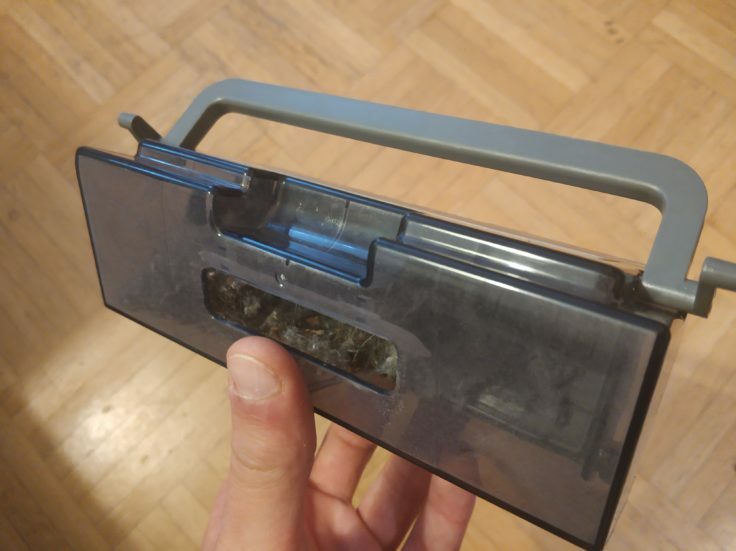 With the 930, however, we really appreciate it: The surface (flap) isn’t just smooth as on the DE33, but slightly corrugated when you put your hand over it. The top has such a fine structure that you might think it’s aluminium, but plastic. Also the used colours black and blue are much better than the ones of the China branch and look very modern. In addition, the LD sensor is a real eye-catcher. 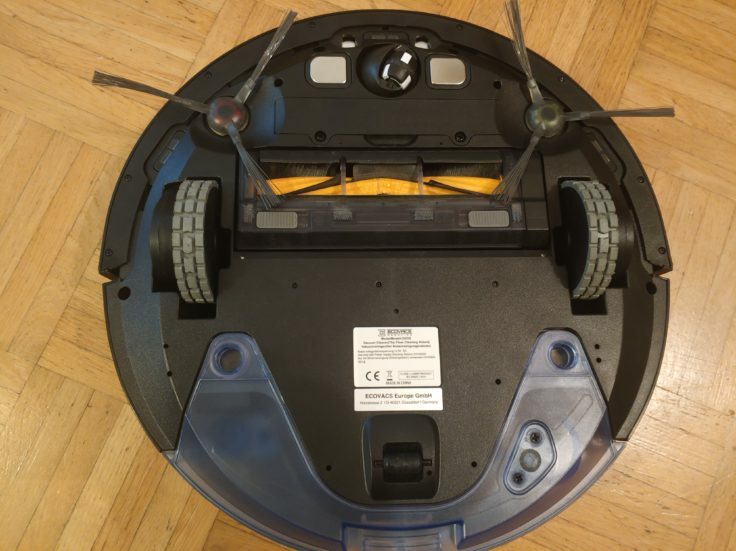 All in all, I think it’s the smartest vacuum robot we’ve tested so far. The DEEBOT also scores at second glance: Impeccable workmanship, all individual parts are firmly & shake-free and a CE mark is also part of the game. The dust chamber is with 0.47 l rather small ( more than 0.6 l is a good value), but of course it depends on the dirt in the flat, how fast the chamber gets full. However, you can assume that you have to empty the chamber after each vacuuming process. 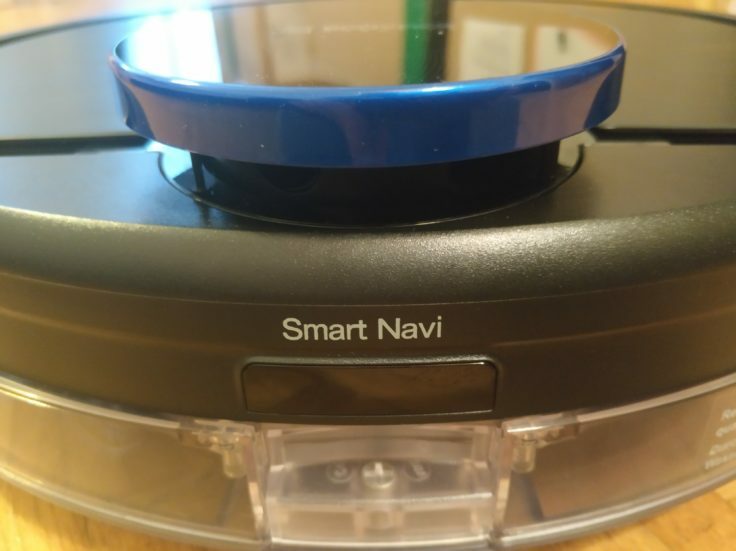 So you can let the vacuum robot vacuum the whole apartment without having to empty the dust chamber manually. 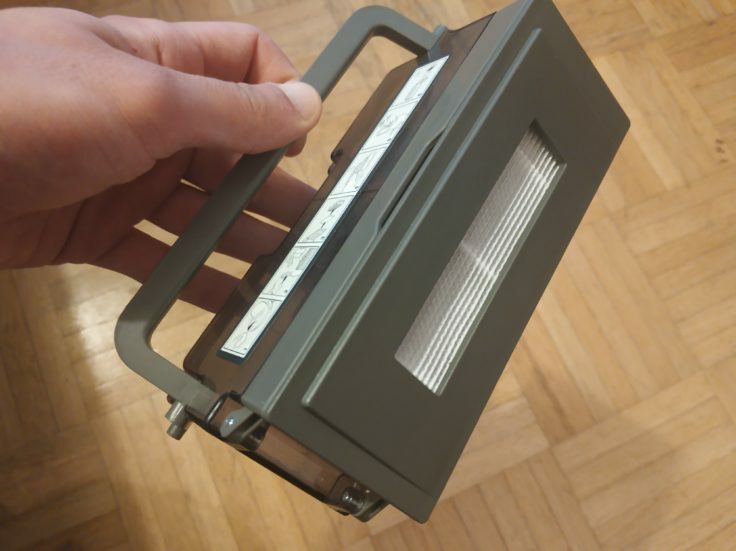 The dust chamber is located under the flap. Could be bigger, but it serves its purpose. The chamber fills up quickly, but normally offers enough space for cleaning. 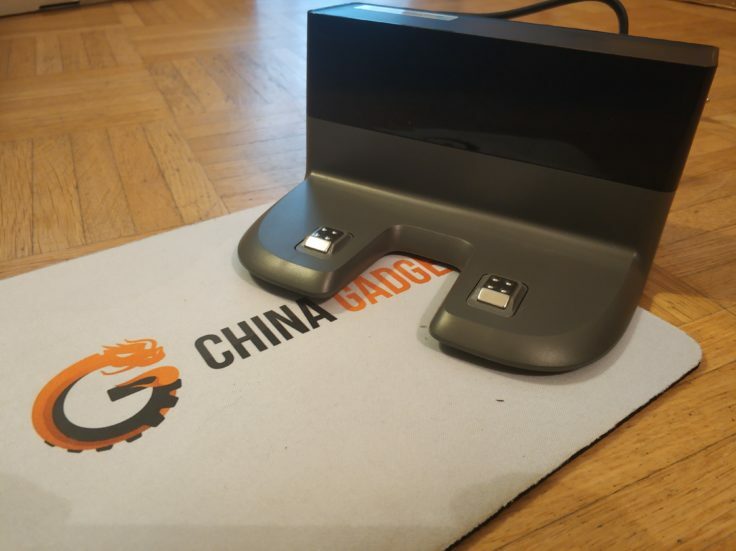 Since I don’t let a vacuum robot wither somewhere in the storage room like the conventional vacuum cleaners in the past, but want to place it in my own field of vision, the design of the charging station also plays a role in the evaluation of a robot. In addition, our round helpers should have it nice in their “home”. 😉 After all, they start their work from there and (ideally) find their way back there autonomously. Unfortunatly you have to say: Optically okay, but it could be nicer. “Purposefully” is probably the best way to describe it. The loading time of the vacuum robot is 4 hours. 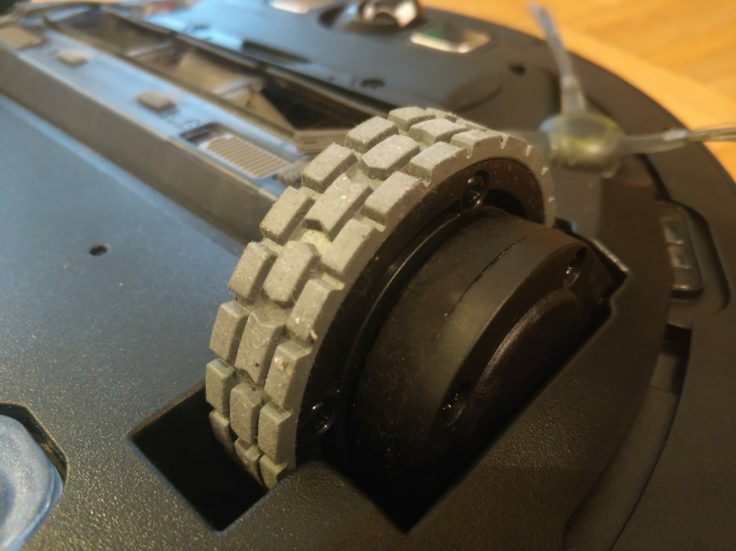 On the underside there is a rubber holding surface that ensures that the station does not slip when the vacuum robot drives to the station for charging. You shouldn’t place anything one meter frontal to the charging station, as the robot moves about one meter backwards at the start. The charging station is not necessarily as visually appealing as the robot itself, rather functional. Very practical: The charging cable can be rolled up on the back of the station, so you save space and don’t have any unnecessary cable lying around (which vacuum robots don’t like anyway). Space-saving: The charging cable can be rolled up at the station. 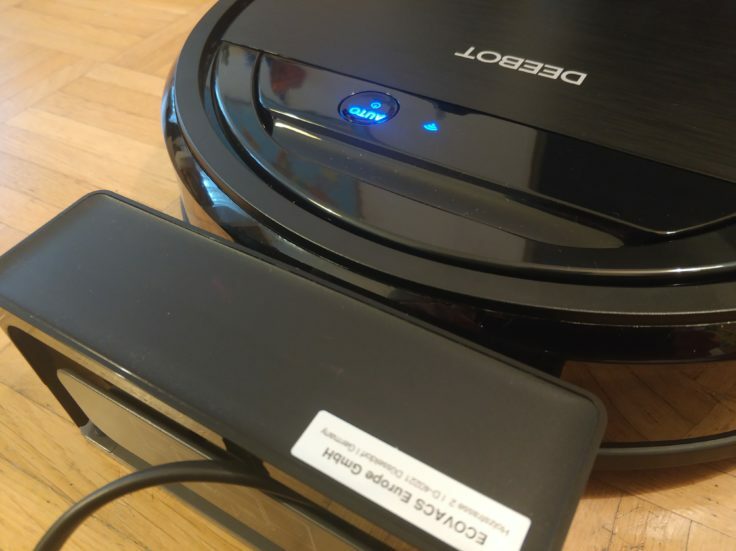 After a charging time of 4 hours (average value), the DEEBOT is ready for use for a working time of 2 hours. These are both average values for a vacuum robot; thanks to the good navigation, the working time is also sufficient for rooms above 120 m². After all, the better the chosen route through the house, the less battery is consumed. The vacuum robot automatically finds the station when the battery level drops – and that without any problems. The autonomous retrieval of the charging station is no challenge for the 930 due to the room measurement, provided that the charging station is not adjusted during a cleaning process. 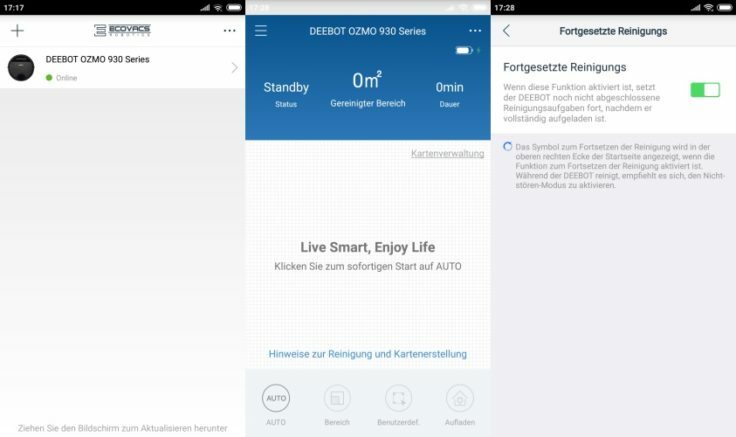 The DEEBOT OZMO 930 also measures the home in automatic cleaning mode without an app – this cannot be reproduced without an app connection. 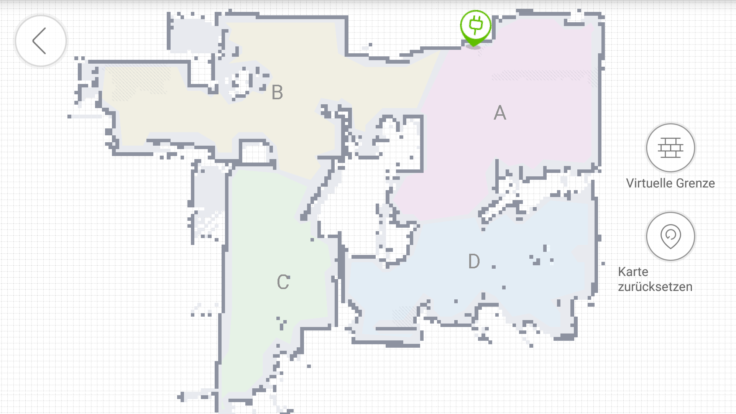 By creating a map of the rooms, the 930 finds the most efficient way through the four walls. After it has turned a corner to scan the room, it travels the room in straight lines from wall to wall. 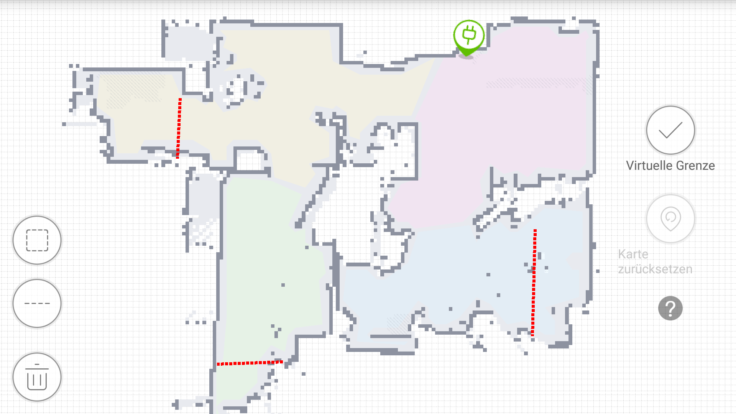 He divides the room into quadrants and then scans them. This is how the robot navigates through the premises. 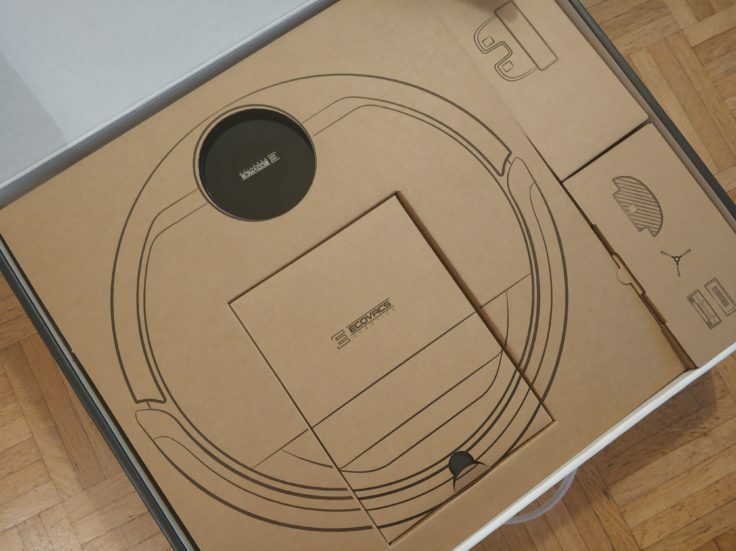 We know this type of navigation from the Mi Robot or RoboRock S50, for example, and it works just as well as with the two Xiaomi vacuum cleaners. Every now and then it has one or two small problems with bottlenecks. But since it optimizes its cleaning path (more on this later), this is usually no longer a problem in the third attempt. What works impressively is the carpet recognition. As soon as it is on a carpet, or even just on a doormat, it noticeably increases the suction power and cleans more efficiently than in normal suction mode. The OZMO 930 navigates very smartly through the four walls, recognising surfaces like carpets. The robot can only be started via app or start button on the top. A remote control like the ILIFE models is not included. So if you don’t want to use the app, you’ll be much more restricted in the operation and have to bend down to start and stop the DEEBOT. Without an app, one of the decisive factors of a vacuum robot is omitted: it cannot be started while on the move. The only thing you can do is switch it on manually before leaving your home. But those who use the app enjoy some very pleasant advantages. More about that now. The robot can be started manually using the buttons on the top. First of all, the note that currently applies to all vacuum robots: The OZMO 930 can only be connected to a 2.4 GHz network, not to the now common 5 GHz network. With most WLAN modems, however, this can now be changed over, i.e. both 2.4 and 5 GHz can be used. The conversion works differently depending on the modem and provider, just start a search engine query here. Initially the app had some difficulties according to customer reviews, which were fixed by firmware updates over time. As usual with almost all apps, a registration via mail address is necessary. Since you never need it again (if you don’t forget your password at some point), you can simply enter a spam/disposable address. 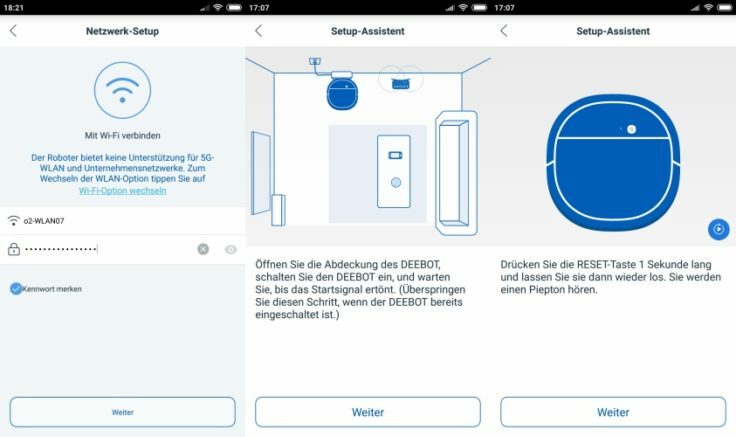 Nice: With the illustrated (also moving image) instructions within the app, the connection with the robot should be successful even for those who are technically little or not at all versed. Registration via e-mail address, then select the appropriate model. 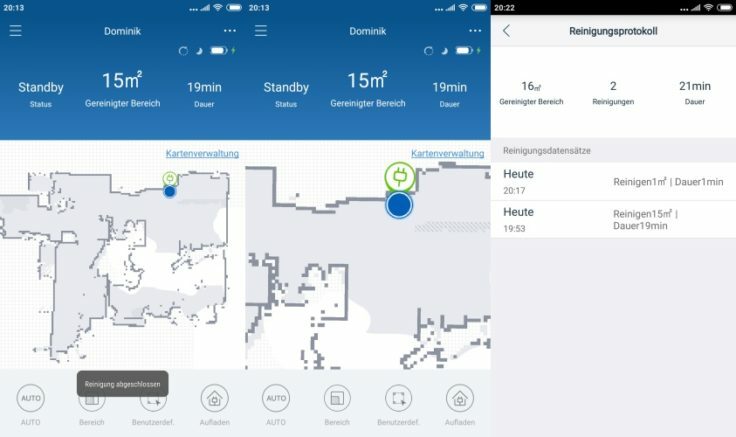 The next step is the connection to the in-house WLAN. To do this, the robot must be switched on and know its WLAN password. After entering the password, briefly press the reset button until you hear a short beep. Enter WLAN password, press reset button for 1 second, next step. Wait a short moment until you connect to the DEEBOT network (“Ecovacs-xxxx”) and the process is completed. A simple procedure, if you have switched to the 2.4 GHz network in advance and enter your WLAN password correctly (frequent error, therefore the supernatural frequent mention). 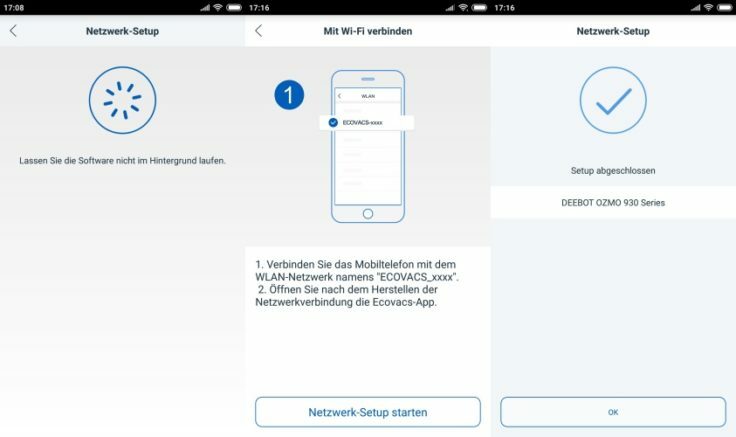 The entire process of connecting to the WLAN takes only one or two minutes. Now we are greeted by the robot, which is displayed as “Online”. If it is offline, we cannot have it in the app. 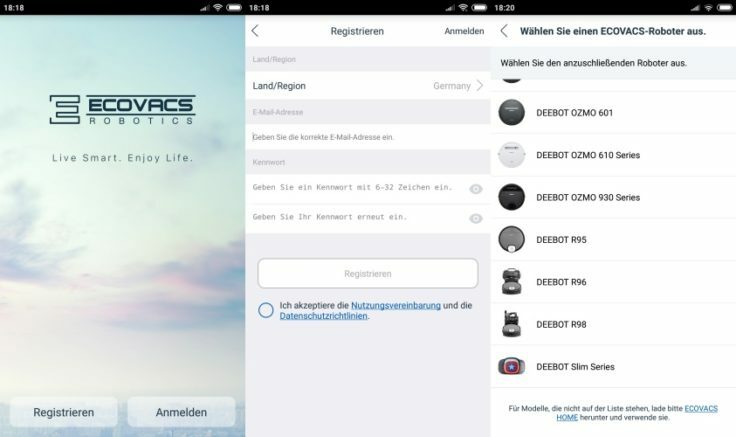 The start screen reminds us of the navigation within the RoboRock or 360 app: the most important functions, commands and information are bundled there. Clear menu: the three dots in the upper right corner of the middle picture lead you to the settings. A very large number of functions can be found in the settings. A very long list. But what is missing? The remote control/joystick is not included in the app. So the robot cannot be steered hair-precisely, one makes however also only rarely use of it (pursue the partner by the dwelling etc.). Although the map is not drawn “live” in the app while the robot is driving, this does not bother anybody. But the map display is quite accurate, even if the RoboRock map is a bit more accurate. But the mapping has a few advantages compared to other models. The created map. The green socket symbol represents the charging station. Right: The cleaning protocol. In the app, the apartment is then divided into different areas (A, B, C, D). 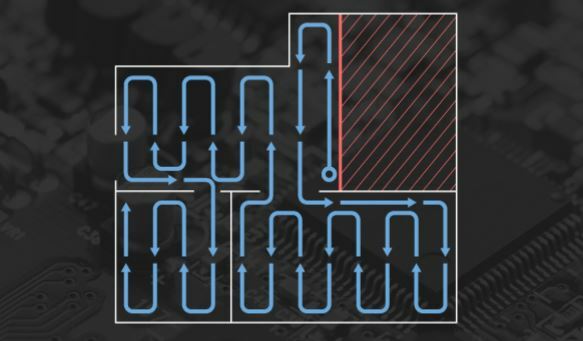 For example, you can tell the robot to only vacuum area A or D. The trick: You can assign a certain working time to each area, during which the robot moves the area (e.g. area B at 15:10, area D then at 17:30). 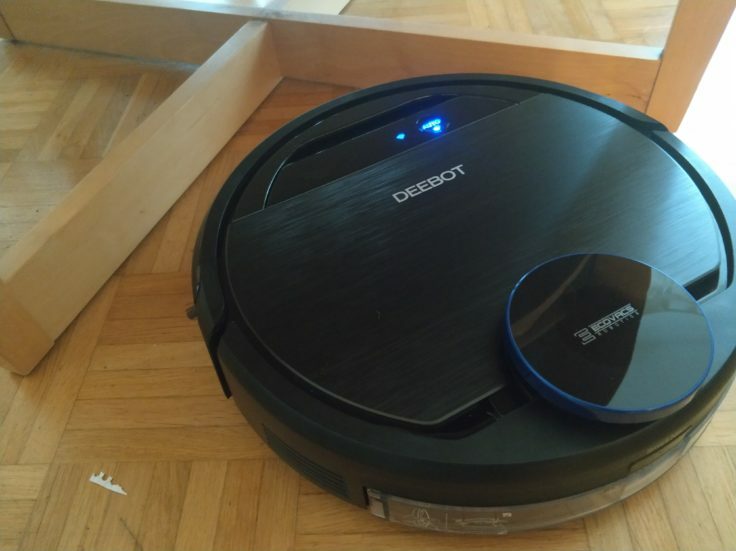 Since it is also possible to set the robot to continue cleaning when the battery is low, if it has not yet left everything, the size of the apartment does not really matter. The map is divided into four different areas, which can then be edited with virtual walls. Once the DEEBOT OZMO 930 has created a map (and its owner has not removed the charging station), it finds a much faster and more efficient route than on the first lap. He “learns” something new. Even if new items get into his usual way (like a newly bought chair), he updates the map. This is also the case, however, if you leave a door open or close it accidentally during your preplanned cleaning (you yourself are on the way). Plays a subordinate role, but may be important to know. If you want to send the vacuum robot into a certain area (e.g. the hairy dog corner), you simply draw a square in the area. The robot then moves straight from the station to the specific area and vacuums only this area. Zone cleaning: Where the square is drawn, the robot vacuums exclusively. There are also various ways of drawing virtual walls. If you do this with a square, you can exclude these areas from cleaning. 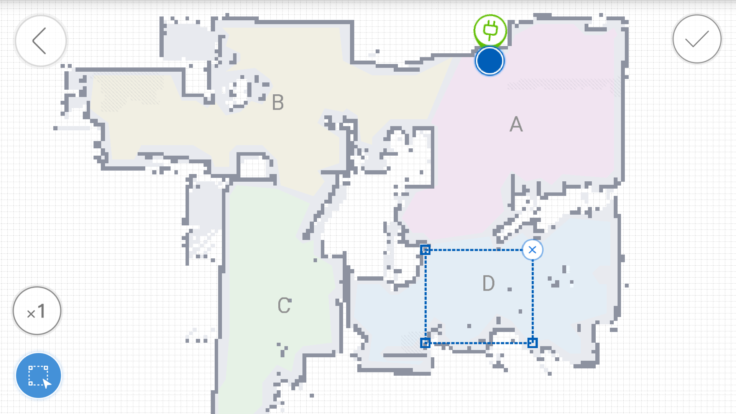 With the virtual borders, you can draw straight lines on the map and thus exclude entire rooms. The robot does not cross the virtually drawn red lines. Looking at the technical data in the run-up to the test phase, it already became clear that the OZMO 930 is a direct contender for the top positions of the best vacuum robots. However, one shortcoming only became clear in the test phase: the suction power is significantly lower than that of the RoboRock S50 (2000 pa). Is the OZMO 930 threfore not so successful? Far from it. The robot must of course be switched on under the flap before the start. The OZMO 930 scores more with obstacle detection than with suction power. The obstacle detection is extremely positive; the concentrated load of built-in sensors inside the OZMO enables it only not to detect and drag very small obstacles. These include cables and socks. Other vacuum robots are not yet able to detect such small objects. A large number of sensors can be found on the underside. The 930 reliably detects pieces of furniture at an early stage and brakes a little before approaching the piece of furniture and docking it lightly so that it will be cleaned shortly before it reaches it. What’s positive is that the OZMO 930 also detects complicated things. These include the curtains (it doesn’t drag along, but sweeps) or the training bag that is in its way (doesn’t push it away, but turns around). The obstacle detection is almost perfect. The robot works with two brush heads with which it does not reach all corners of the room optimally. Depending on how complicated a corner is, a battery-powered vacuum cleaner is useful for subsequent cleaning. However, this is a problem that all robots have to struggle with. In comparison, the DEEBOT does very well and takes out all the dust and dirt that a round household helper can get out. The operating volume of 65 dB is on average loud and only just above the volume at which we humans talk to each other (60 dB). In fact, the vacuum robot is perceived to be even quieter, even if the sound level measurement came to this conclusion. 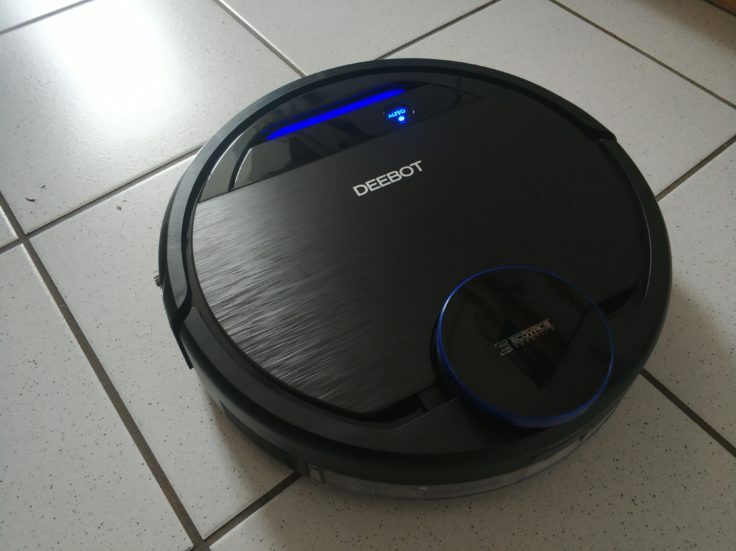 Compared to the vacuum robots I usually test, I hardly noticed the DEEBOT in terms of volume. Watching TV on the side is not a problem. In order to work quietly, the OZMO does not always work at the highest suction level. You can judge that positively or negatively. In standby, the engine sounds like a small lawnmower, although it doesn’t move. The operating volume of 65 dB is completely within limits. The DEEBOT also talks to its owner (or to everyone around him) and informs him of its operating status (empty battery, suction mode, etc.). This can be practical because you know what’s bothering the robot, but it can also be very annoying. 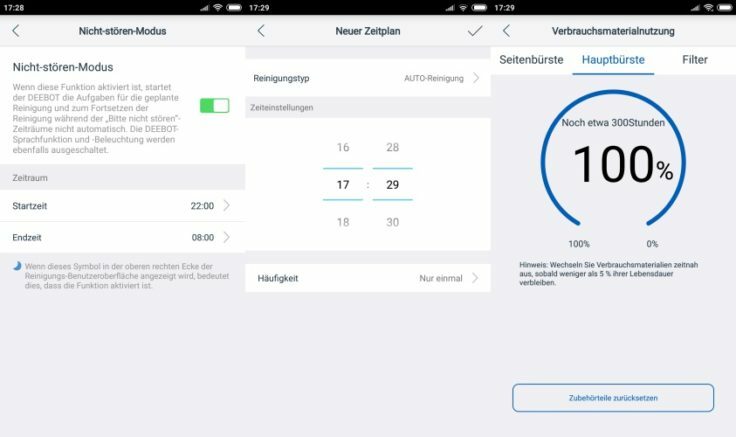 For this, there is the Silence mode, which immobilises the vacuum cleaner; this can be set via the app. 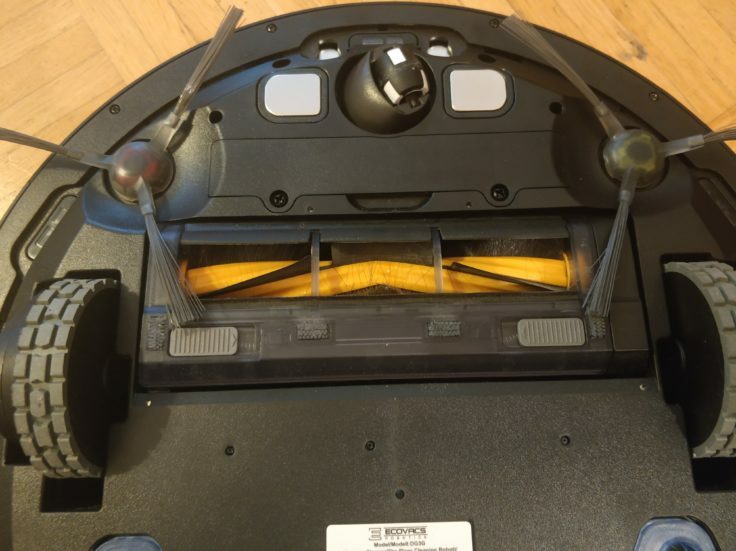 The surface does not play a major role for the vacuum robot, but the grooves here are not perfectly cleaned. Normally, like most vacuum robots, the robot cleans using an electric brush. If, however, you suspect a lot of long hair in your home (e.g. long hair cats, dogs etc. ), you can alternatively remove the brush and attach an attachment with a suction opening. This prevents the hair from wrapping around the brush and having to be cleaned. In most cases, however, the use of an electric brush makes more sense, as it significantly increases the cleaning effect, especially on carpets. Gradients of up to 15° are still a manageable challenge for the DEEBOT, but above that it becomes very tricky. Since there are usually no higher gradients in flats, however, it comes on almost all carpets or sometimes with a skilful jerk over the legs of the laundry rack. Dark corners or surfaces are no problem for the sensors of the DEEBOT. With its tyres the robot overcomes obstacles with a height of up to 1.5 cm. 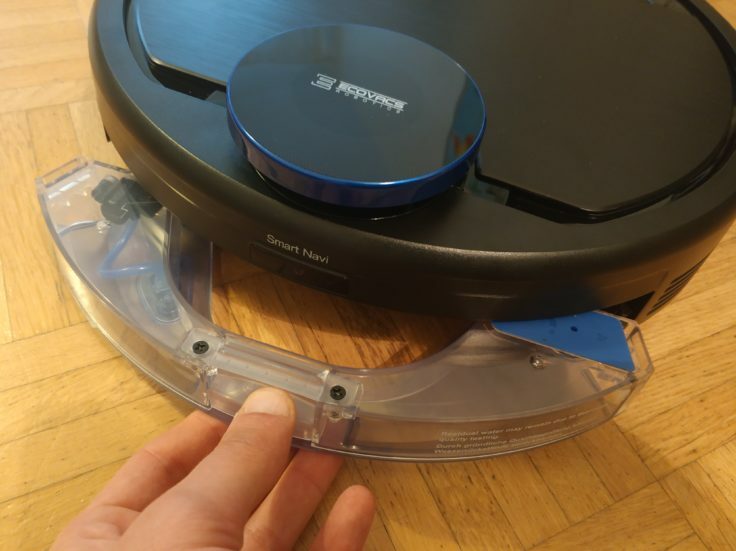 Should there be very high door thresholds (over 1.5 cm height) or carpet edges, I recommend to place door threshold ramps for the vacuum robot. Of course you can save the money with a bit of skill and make your own ramps, the ones who are really smart can simply print the ramps in the 3D-printer. If you take a closer look at Ecovacs, you will inevitably come across the term “OZMO technology” again and again. Among other things, this means that the robot can vacuum and wipe wet in one pass. But the trick is: If the 250 ml water tank is attached to the underside of the robot, its sensors recognize that the wiping mode is required and can even interrupt the moistening of the microfiber pad. 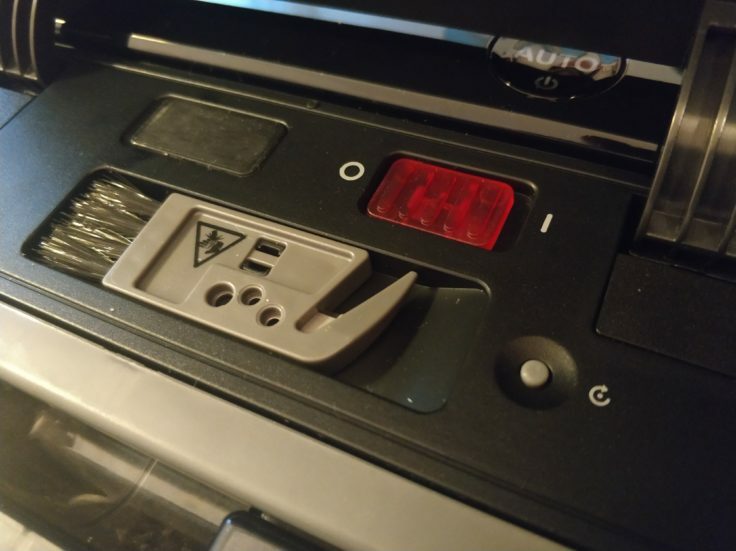 Since the OZMO 930 detects carpets, it does not drive on them in wipe mode. So you don’t have to clean your carpets if you want to have them wiped through. By the way: The amount of water left on the pad can also be determined in the app. Fill the water tank with water. Insert the water tank on the underside. Insert the wiper attachment with the microfibre cloth on the underside above the tank (snaps into place). The water tank is filled with water and pushed into the back of the robot. Wiping vacuum robots – more than just a wet floor? In fact, the wiping function of the 930 turns out to be quite useful, the water is evenly distributed on the mop and also on the floor. This prevents puddles from forming and makes the floor visibly cleaner. 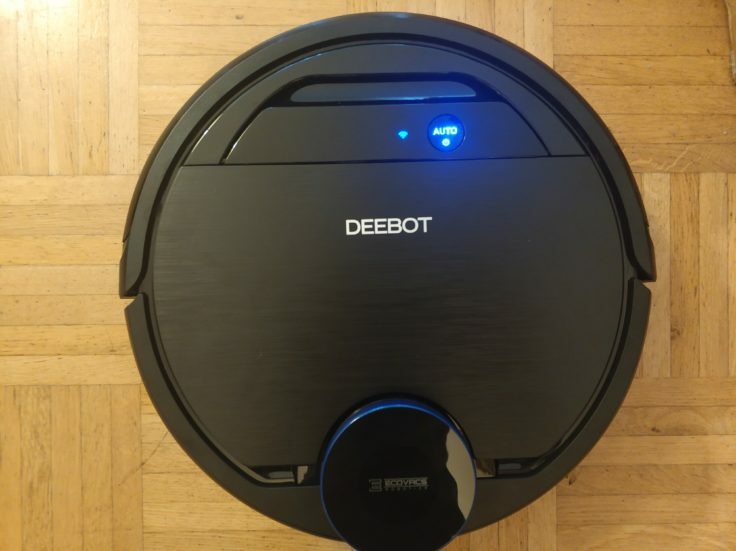 The only problem here is the 0.25 l small water tank, which makes it impossible for the DEEBOT to clean large areas without filling up in between. However, we are already talking about cleaning above 100 m², i.e. everything in the green area. Specifying the amount of water via the app supports wiping. It is easy to insert the tank, but to attach the wiper attachment you have to turn the robot around. As you already know from other vacuum robot tests, cleaning with a mop is still more effective than the wiping function of a vacuum robot. But the robots are always getting better, the floor really cleaner than before. Accordingly, frequent wiping can be avoided and only in exceptional cases can you swing the mop on your own. Let the robot wipe two to three times a month and then let your own ambition decide whether this is not enough. With the DEEBOT OZMO 930, that’s quite enough for me. Good job, ECOVACS. Unfortunately, there is no water protection mat in the scope of delivery that catches the moisture at the charging station. But well, you can’t have everything. Start cleaning (“Alexa, start cleaning with DEEBOT.”). Stop cleaning (“Alexa, stop cleaning with DEEBOT.”). Send back to the charging station (“Alexa, tell DEEBOT to drive to the charging station.”). The problem with the Alexa control is that you have to pronounce the commands in the same way as they are written, so that Alexa understands what you want from her. This is of course not a mistake by the skill developers, but by Amazon. But it would be nice if you could schedule working hours (“Alexa, start DEEBOT tomorrow morning at 9 am”) and possibly even combine this with area cleaning (“Alexa, clean area C at 11 am”). But what is not, can still become. So I find the App control even more useful than the Alexa control. The Chinese manufacturer of household robots (also window cleaning robots in its range) has been expanding from its home market in China since 2006 and is increasingly expanding its sales in Europe. ECOVACS Robotics has been the market leader in the Asia-Pacific region since 2010 and already holds the second largest market share in Europe. 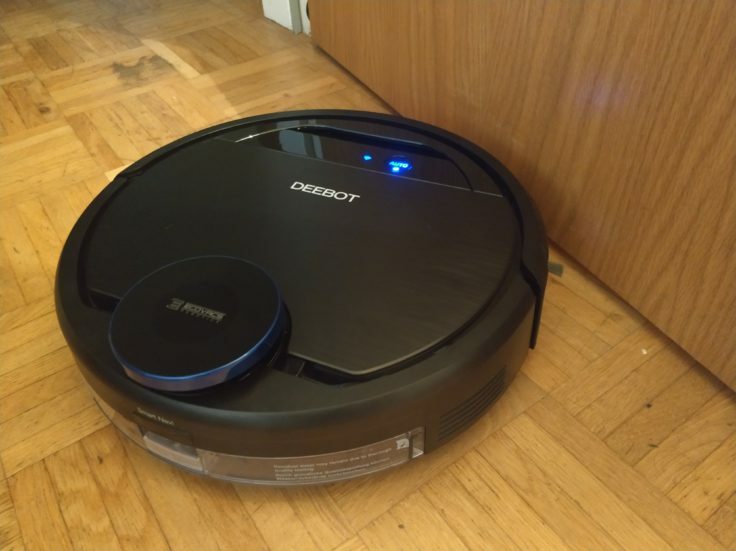 This experience and far-reaching development is noticeable: The DEEBOT OZMO 930 is one of the best vacuum robots on the market. But you have to dig a little deeper into your pocket for this, even if there are still considerably more expensive models with warranty, support, fast shipping and CE marking (Vorwerk, iRobot, Dyson…). However, these points are worth a little more money to one or the other. When it comes to navigation, app functions and operating volume, the OZMO 930 and the current top model RoboRock S50 don’t do much. 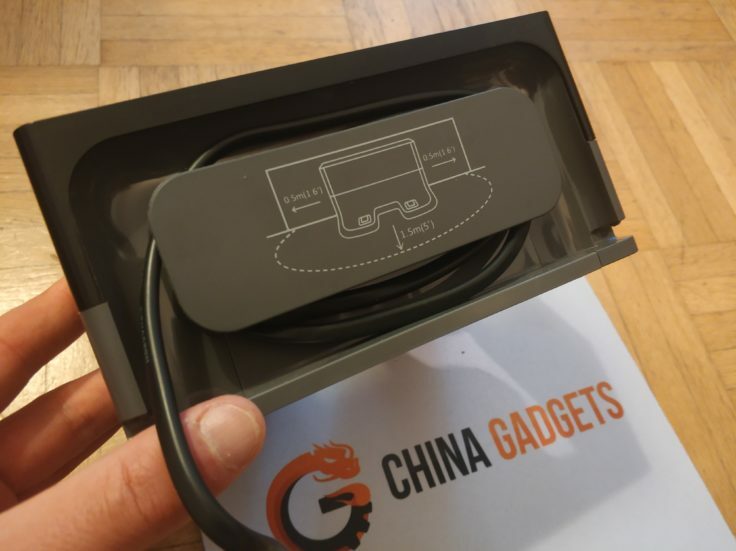 The wiping function and carpet detection are even better on the ECOVACS model, but it works with less suction power and doesn’t overcome obstacles as well as the Xiaomi model. Both robots offer the current maximum range of functions and (if you are willing to spend the money) are a very good solution for almost every household. Which ECOVACS model would interest you most and is the most exciting for a future test?